One of the most common claims made about the difference between inflection and derivation in the morphological literature is that derivational affixes change the word-class of their base, while inflectional affixes do not change the word-class. In this paper I argue that this view is wrong, and that important insights about the nature of inflection and derivation are lost if word-class-changing inflection is not recognized. In §2, I present a number of examples of word-class-changing inflection, and in §3–5 I discuss several potential objections to my analysis. I show that the cases in question can be regarded neither as word-class-changing derivation (§3–4) nor as non-word-class-changing inflection (§5), and that a description in terms of feature neutralization is not a general solution (§6). In §7 I argue that to account for the syntactic properties of words, two types of word-class have to be distinguished: lexeme word-class and word-form word-class. §8 discusses some problems that arise in the formal representation of this proposal in constituent-structure trees and observes that Tesnière’s dependency grammar provides an interesting perspective. Finally, §9 discusses the universal correlation between inflection and preservation of internal syntax, and derivation and the non-preservation of internal syntax. 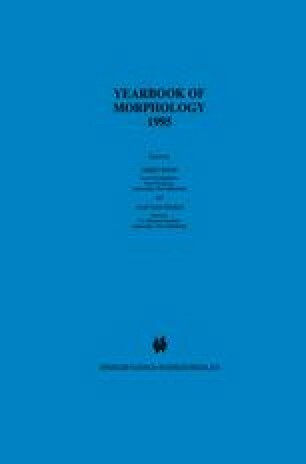 Versions of this paper were presented at the Annual Meeting of the DGfS (Münster, March 1994) and at the 6th International Morphology Meeting (Szombathely, September 1994). Useful comments were provided by the audiences at these conferences, by Geert Booij, Grev Corbett, Davide Ricca, Richard Waltereit, and an anonymous reviewer. I am grateful to all of them.